Damn, I have been M.I.A! This new schedule has me strapped on ‘blog time’! My new opening shift is SUPER busy, so I hardly have time to even check my personal email. On the plus side, time flies and I can plan my training after work down to the ‘T’. I’ve been pretty consistent with my training. I feel like I’ve found the perfect balance! Gym, tan, pose, meal prep….. gym, tan, pose, meal prep… SLEEP! REPEAT! 23 more days, getting tight and lean. No two-a-days, not enough hours in the day or energy pumping through my body for that. I’ve accepted it. I feel like I train so hard that I won’t need the extra calorie expenditure, especially since my diet has been on point with a few minor hiccups here or there. Instead of taking days off completely, I bought a Groupon for Get Zen Hot Yoga, a studio a 20 minute walk from my house. Last Sunday I went to the Restore class, very relaxing but the room wasn’t as hot as I expected. This weekend I plan on going to the Power class, I want to get my heart rate up and SWEAT! Last weekend I had posing practice with one of Derek’s friend’s from NPTI school, her name is Nneka. She’s a member of the ‘Save Fitness’ team with Tanji Johnson and helped me out SOOOO much! She made posing look like a BREEZE! All I need to do is practice, practice, practice, but I feel so much more confident, she taught me how to transition into my poses smoothly. I’m so grateful for her help! I was so worried about my posing! She also gave me all the details on how I should deplete my water, I feel so prepared! I bought my hair clip for the show! I found an amazing plumeria hair piece on Etsy! A woman from Maui makes them herself and bedazzles them in Swarovski Crystals, she shipped it at the beginning of this week, I should be getting it tomorrow! EEeeeeek, so freakin’ excited! Check out her Etsy Shop: Mauiblingbydeneen. She also has a Facebook page with more photos of her products. Just message her, she’ll send you photos of her current pieces and post them on Etsy for you to provide your payment and shipping information: Maui Bling by Deneen, LLC. I also picked out my nail polish, I will be doing my own make up and nails. I am debating having my hair done by my hair stylist from the salon I used to work at a lil’ over a year ago. She still cuts and colors my hair. I’m hoping she can straighten my hair to look super sleek, but also give it volume since I will be waiting all day to go on stage. I JUST Facebook messaged her! We’ll see how much she charges, how she suggests styling, and if she even has any appointments available that day! I also need to schedule my spray tan appointment for the day before! That is my goal this week! I bought my half gallon jug for my depletion phase, my ‘Xpel’ water retention pills, and some treats for my ‘Rewards Box’! 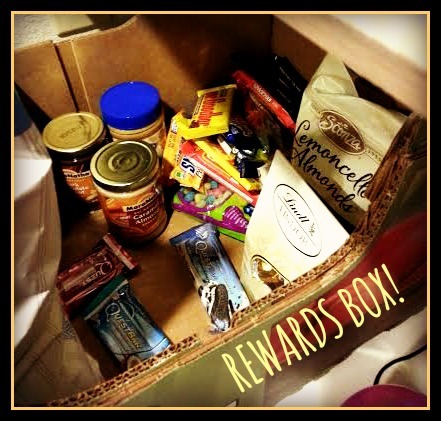 So far my ‘Rewards Box’ is full of Girl Scout cookies; Samoas, Savannah Smiles, Tagalongs, and Thin Mints; Peanut Butter Snickers, Mr. Good Bar, jelly beans, Cadbury Eggs, limited edition Sugar Cookie Pop Tarts, Caramel Almond Maranatha Spread (of course), Quest Bars, Cheddar and Caramel Popcorn from Costco, and I have Coconutter Spread from Sweet Spreads coming in the mail! ‘Maple Pancakes’ and ‘White Chocolate’ flavors…. YUMMM! Can’t wait to try them, bake with them, and make delicious recipes to share. That’s my next project: creating a Recipe book! I have SOOOO many ideas, I miss exciting food! My goal is to completely cover the bottom of the box! There are 6 boxes of Girl Scouts hiding in the upper left hand corner as well as Cheddar and Caramel Corn! This weekend I have my second photo shoot with Amir! Finally getting my Belle_Vue Design Photos done. I feel like I am lean enough to do the suit justice! However, now it’s a lil too big in the booty, so I’ll have to pin it in a couple places to fit just right. I’m kinda nervous to be half naked in front of my friend and co-worker, but Derek will be there and it should be quick and painless, just a couple poses that I would be doing for the show. I’m excited to see what I look like from behind the camera! 3 1/2 weeks out! 23 days! Big goals to achieve from now until April 26th, and more goals to set afterwards. So excited at the endless possibilities….. Stay tuned! Big accomplishments and updates ahead!